I always like to start out non-green product reviews by stating that sometimes we receive products, even though we state we will be evaluating any samples sent based on eco-friendly qualities, that do not really fit the ethos of this blog. That being said, I feel obligated to review every item we receive, and sometimes, we simply get cool things that aren’t so green. 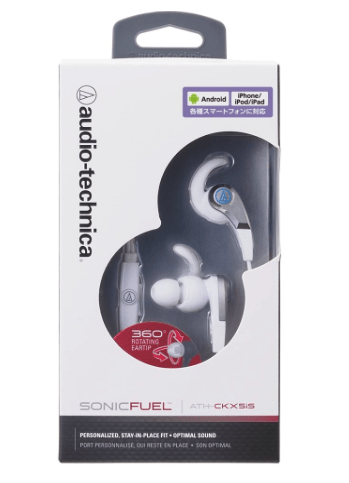 We were sent a pair of [amazon_link id=”B00EC58KJW” target=”_blank” ]audio-technica SonicFuel in-ear headphones for Smartphones with In-line Mic & Control ATH-CKX5iS [/amazon_link] to try. I am not a runner, so perhaps I am not the best person to say whether or not these earbuds truly stay in place, but occasionally I feel the urge to sprint. When I do, my Apple earbuds always fall out. First one, then the other. It is super annoying. The custom fit and c-tip of these SonicFuel earbuds make them the best for running or other outdoor activities. Although I enjoy listening to the sounds of nature when I hike, I also find it a great time to practice Italian with Dualingo or listen to dharma podcasts. Earbuds are a necessity on these occasions. These earbuds are made in China. I did find an Environmental Quality Standards for Products for the company from 2012. It talks about prohibited and controlled substances, such as heavy metals and flame retardants, but it does not address sustainability in manufacturing or any goal setting for reduction of energy, chemicals, or packaging.